When implemented effectively, technology has great potential to positively connect with learning, assessment, and motivation in the context of K–12 science education and inquiry. Written by leading experts on technology-enhanced science learning and educational research, this book situates the topic within the broader context of educational psychology research and theory and brings it to a wider audience. With chapters on the fundamentals of science learning and assessment, integration of technology into classrooms, and examples of specific technologies, this concise volume is designed for any course on science learning that includes technology use in the curriculum. It will be indispensable for student researchers and both pre- and in-service teachers alike. "Ketelhut and Tutwiler’s Science Learning and Inquiry with Technology offers an engaging overview of the need for real-world science education in our schools and of the impact of innovative technologies in supporting scientific inquiry and knowledge building. It is an essential guide for teachers, researchers, and designers seeking to understand and impact science learning and teaching." 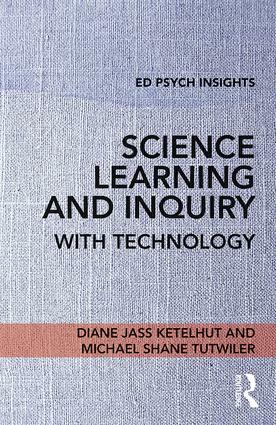 "In Science Learning and Inquiry with Technology, Ketelhut and Tutwiler have written an incisive book on a critically important topic: how technology-rich learning can yield foundational improvements in science education. With a fresh perspective on learning, assessment, and motivation, the authors provide a compelling analysis of the transformative potential of learning technologies for science classrooms of today and tomorrow." Diane Jass Ketelhut is Associate Professor of Teaching and Learning, Policy and Leadership at the University of Maryland, USA. Michael Shane Tutwiler is Assistant Professor of Educational Foundations at the University of Rhode Island, USA.